It’s awards season! Don’t you love this time of year? I certainly do. I spent last night curled up on my couch watching the stars wine and dine at The Golden Globes. While I felt like there were some surprises, I was all-in-all pleased with the award winners (i.e. Modern Family for Best Comedy Series and Michelle Williams for Best Actress). I was even more pleased with what I saw on the red carpet! Hollywood’s leading ladies looked stunning in a combination of jewel-toned hues (Frieda Pinto’s teal Prada was a standout) and more subdued blush and ivory tones. Michelle Williams wowed me in her Jason Wu navy gown (though I really would have preferred it without that headband). Even the young starlets delivered on the red carpet. Modern Family’s Sarah Hyland and Ariel Winter looked amazing! My very favorite of the evening was the J. Mendel column gown worn by Claire Danes. The black cut-out design of the sleeves was such a beautiful detail, and I love that she kept her makeup and jewelry super simple. Any favorites? Tell me what you think. One thing’s for sure: I have a lot of movies I need to see before the Oscars! I loved Claire Danes dress! This is the perfect roundup of dresses, all of my favorites! Reese Michelle, and Freida blew me away! I love your picks. I was in love with Kate Beckinsale and Reese, as well as Charlize Theron. Michelle Williams did a fabulous job in My Week with Marilyn- she def deserved her award. Reese & Claire were two of my favorites! Gorgeous! My 2 absolute favorites were Jessica Alba and Mila Kunis! They always look amazing. Claire Danes looked amazing! I also liked Zooey Deschanel's dress. And Reese and Diana Argon in their red dresses – stunning! Whaattt, no Charlize Theron? Granted, she might've been high, but she looked impeccable. Claire Danes dress is by far my favorite! I was obsessed with it the moment I saw her on the red carpet. Definitely daring, but elegant! I loved Jessica Alba's also. Love Michelle Williams. I was also a huge fan of Charlize Theron and Julianna Margoulise. Claire Danes was my favorite, too! I also loved Evan Rachel Wood and Maria Menounos – they both looked gorgeous in gowns that only they could pull off. 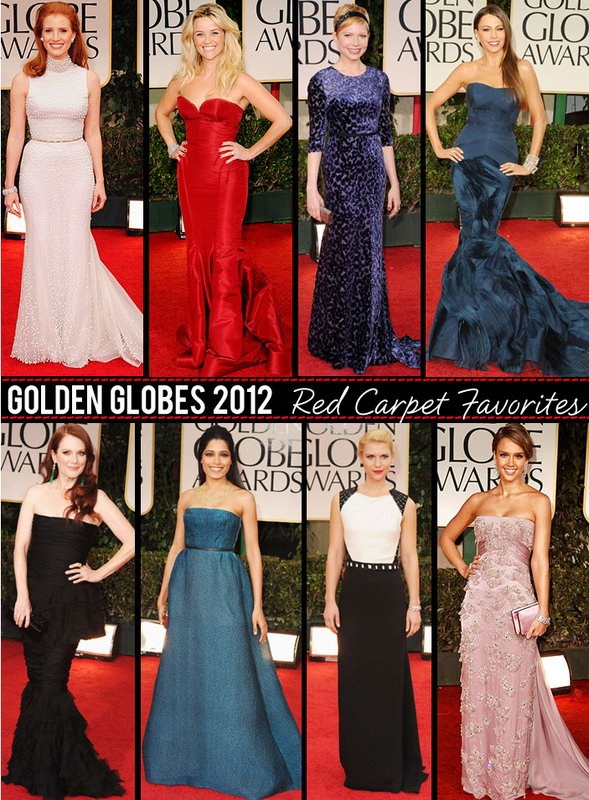 Loved your pics to highlight from the Globes. As usual, Sofia Vergara looked stunning. Loved Claire Dane's dress. So classicly chic. I loved Jessica Chastain, too! I have really been loving her red carpet style and what she's been wearing to promote The Help!